Indonesia, home to 230 million people, is one of the world’s major emerging economies and emitters of greenhouse gas emissions (GHG). According to its National Council on Climate Change, the country emitted about 2.1 giga tonnes of CO2 (GtCO2) in 2005, which is about 5% of global GHG emissions, while it contributed only 0.6% to world Gross Domestic Product. At the global level, 57% of GHG emissions originate from fossil fuel combustion. Unlike China and India, most of Indonesia’s emissions do not originate from industrial activities. In fact, 38% of the country’s total emissions are from peatland (with the majority caused by fires) and 35% are caused by changes in land use. In a country that has the third largest tropical forests in the world, this will continue to mean considerable environmental degradation and health costs, a decrease in agricultural productivity, and material damage. Under a business-as-usual scenario, emissions from peat fire and land use and forestry are expected to grow to 1.64 GtCO2 by 2030 (from 0.91 GtCO2 in 2005), bringing the country’s estimated total GHG emissions to 3.3 GtCO2, according to the country’s Second National Communication under the United Framework Convention on Climate Change (UNFCCC). To overcome this unfavourable development in countries like Indonesia, “green growth” has been proposed as a new way of pursuing economic growth and development. This concept — which purportedly avoids environmental degradation, loss of biodiversity, and unsustainable use of natural resources — has been connected to the “green economy for sustainable development and poverty reduction”, a theme of next summer’s Rio+20 United Nations Conference on Sustainable Development. Several key strategic elements are identified as being required to achieve green growth, all of which apply to Indonesia: phasing out oil subsidies, acceleration of innovation and diffusion of green technologies, supporting a sustainability transition through policies aimed at upgrading skills and capabilities of workers, strengthening of international cooperation, and measuring progress by development of a transparent and responsible accounting framework involving social, economic and environment indicators. The transition to green growth also entails a shift from fossil fuels to renewable energy sources. 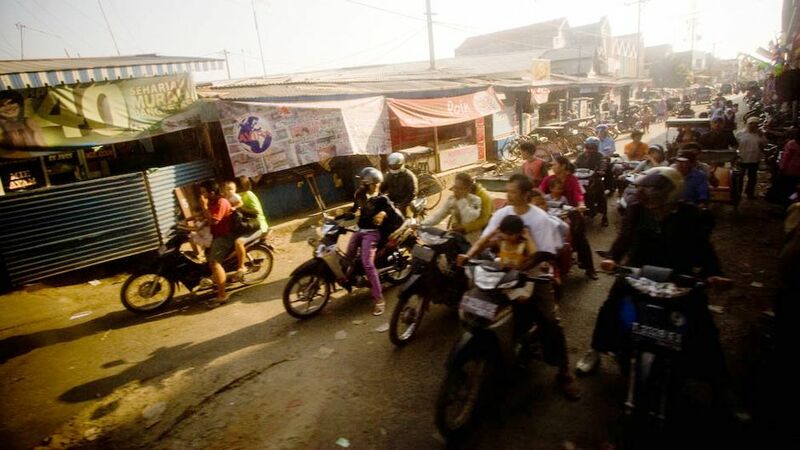 Significantly, over 50% of Indonesia’s energy demand — which increased rapidly at a rate of 3.7% per year between 1990 and 2008 — is met by oil, according to the Indonesian Ministry of Energy and Mineral Resources. Yet depleting domestic oil reserves, lack of investment in oil exploration and an imbalance between oil consumption and production changed Indonesia’s status in 2004 from net oil exporter to net oil importer. In 2005, due to a hike in oil prices, the oil subsidy provided by the government of Indonesia jumped from US$2 billion to $9.7 billion, equal to 3.4% of the nation’s GDP. Overall that year, fossil fuels made up a huge 96% of Indonesia’s energy — 56% oil, 19 % coal and 21% gas — while renewable energy made up the remaining 4% ( 3% was hydropower and 1% geothermal). In response to this situation, in 2006, the government of Indonesia implemented the so-called Energy Mix Policy. The Policy is founded on two pillars: securing energy supply; and increasing the share of renewable energy. Under this policy, the share of renewable sources in the total energy mix is foreseen to increase from 4% in 2006 to 15% in 2025 — 5% from geothermal, 5% from biofuels and another 5% from other renewables like wind and solar. So what have been the impacts of the former policy to date? Firstly, according to the Organization for Economic Cooperation and Development (OECD), the Mix Energy Policy has had a positive impact on the environment by reducing subsidies on fossil fuels from 3.4% to 1.8% of the nation’s GDP in 2009. Recently, the government has started an effort to phase out the use of kerosene for household cooking, which is highly subsidized, to liquefied petroleum gas by 2012. A second key impact of the energy and climate policies has been clearing and expansion of land for production of biofuel crops. There are several new plantations for biofuels crops (palm oil, sugarcane, cassava and Jatropha curcas) as well as developments in the processing industry associated with bioethanol and biodiesel. Up to 10 million hectares of land is to be allocated for biofuel crops alone by 2025. Our research found that palm oil, an important commodity for the food and cosmetics industries, has the highest productivity of all the biofuel crops due to a high crop yield and a low production cost. However, due to land constraints, it appears that planned expansion of palm oil production to 18 million hectares of land would lead to deforestation with consequent biodiversity loss, ecosystem changes and conflicts in society over water and land. As a third key impact, the Reducing Emissions from Deforestation and Forest Degradation Plus (REDD+) program, started in 2009, conflicts with the land expansion for biofuels production area. REDD+ entails a moratorium on deforestation, promotes a reforestation program and in theory would drastically reduce emissions from peat fire and deforestation. At COP16 in Cancun, Mexico in December 2010, donors committed to allocating US$30 billion worth of REDD+ funds to Indonesia. But for the national REDD+ program to be effective it has to also be legally binding, transparent and the reductions in GHGs verifiable. Critically, the scheme needs a payment system to compensate those who have incurred costs as a result of the REDD+ program. Some, including the World Bank, argue that REDD+ payments may not be able to compete with the incomes generated by oil palm production in forested areas, although they may provide sufficient incentives to shift development away from areas with high carbon content. Based on successful implementation of the Energy Mix Policy, Indonesia’s National Climate Change Council has calculated that Indonesia has the potential to reduce GHG emissions by 2.3 Gt by 2030, equal to 7% of global GHG emissions reduction, as required by the Intergovernmental Panel on Climate Change. Achieving this target and reaping the rewards of a Green Economy will not be easy given the competing goals of different national policies. While the energy policy of 2006 seeks to expand land for biofuel production, the climate policy of 2009 intends to implement a moratorium on deforestation. Thus, instead of enlarging the production of biofuels that can cause deforestation, keeping and improving productivity on existing plantations through technology and innovation has the potential to reap more benefits. Regional autonomy and decentralization of economic and political power to provincial and local governments is crucial for this transition to pick up speed as these entities are better placed to address key social, economic and environmental concerns than the central government in Jakarta. The latter should limit its mandate to setting national standards and legal instruments for the transition to be in line with international climate economic and climate regimes. Future policies will not only need to be more coordinated at the national level, they will also need to ensure a sustainability pathway for achieving green growth that reflects Indonesia’s development trajectory. While Indonesia’s GHG emissions now come to a large extent from peat fire and deforestation, in the future they will increasingly originate from the electricity and transportation sectors. This poses a whole set of challenges that, while new for Indonesia, have been dealt with by other, more developed countries. As Indonesia learns from them, perhaps its sustainability transition could eventually be a lesson for other developed and developing countries pursuing green growth. This article is based on the article by Jupesta, et.al., Managing the transition to sustainability in an emerging economy: Evaluating green growth policies in Indonesia, Environmental Innovation and Societal Transitions, doi:10.1016/j.eist.2011.08.001. Green Economy Transition in Indonesia by Joni Jupesta is licensed under a Creative Commons Attribution-NonCommercial-ShareAlike 3.0 Unported License. Joni Jupesta is a Japan Society for the Promotion of Science-UNU Postdoctoral Fellow at the United Nations University Institute of Advanced Studies. An Indonesian citizen, in 2010 he gained his PhD in Management Science and Technology from Tohoku University, Japan. He was one of 25 scientists selected to receive the 2012 Green Talent Award from German Federal Ministry of Education and Research.